QuantaStor appliances support the linking of nodes together for use with the GlusterFS filesystem. Links between appliances for GlusterFS are called 'Gluster Peers' and peer relationships can be attached and detached. 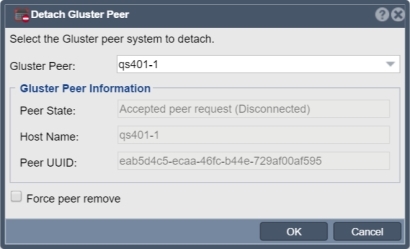 If you're setting up peer relationships and see a peer linkage that is incorrect or using the wrong hostname or IP address you can detach the peer and then optionally re-attach the peer. NOTE: Peer relationships should be using hostnames rather than IP addresses so that you can easily change the IP address of appliances in the future. The problem with using IP addresses for the peer relationships is that these IP addresses are also stored in the Gluster Brick paths which are not easily changed to reflect the changed IP address. This page was last modified on 23 July 2018, at 09:21.